Mount Le Conte may be the most addictive peak in America—certainly in the Southeast. Each of these has logged over a thousand miles on the mountain—the shortest trail is 11 miles round trip and climbs 2700 feet. Multitudes make annual pilgrimages to Le Conte, and some have visited weekly—or even more often. The extreme example is Ed Wright, who climbed this mountain 231 times in 1991 and 1,310 times from 1982 through 2008. Le Conte was his personal domain in more ways than one—he also launched the website mtleconte.com. "We met Ron Valentine and his lovely hiking companion above the upper steps. We chatted for a while. I again asked him about his total hikes. My hearing is marginal, at best, but I think that he said that he had made 798 hikes to Le Conte since January 1, 2000. I think that he said that he had about 3,000 hikes before that. I asked him when he was going to come clean and tell the world of his accomplishments. He replied that he would give the number after I died. I told him that I was not half dead yet." Indeed, Ed Wright (1925-2009) lives on through mtleconte.com. For anyone who follows in his footsteps up Le Conte, he has left a wonderful guidebook, rich with details about the mountain, the hikers, and the trails—-especially the popular Alum Cave route. (Wright's website has been scaled back since 2013, but you can get details by ordering his book from his website.) Another must-read website is highonleconte.com, where the daily blog offers weather reports, trail advice, and fascinating insights from the staff living at Le Conte Lodge. Valentine has been hiking Le Conte since 1946. As of 2014, he has turned 80 and is still climbing, though I don't have any update on his totals. Many of Le Conte's most renowned hikers started relatively late in life, and it seems that the mountain became their fountain of youth. Wright was 60 when he made his second hike in 1985, which was the same year I made my first. It's fascinating and humbling to realize that with 5 climbs at age 57, I am—for the time being—actually ahead of Wright's pace. At one time, Wright's website included the hiking diaries of Paul Dinwiddie (1915-1995), who climbed Le Conte 750 times, 708 of those after he turned 65; as well as Margaret Stevenson (1912-2006), who had 718 climbs, starting when she was 48. The Wednesday before my trip, 55 members of Stevenson's hiking club climbed Le Conte to remember her 100th birthday. Stevenson's bronzed hiking boots are on display at LeConte Lodge. The founders of Le Conte Lodge deserve mention. Paul Adams (1901-1985), who established the mountaintop camp in 1925, made over 500 trips from 1918 to 1975, when he climbed the mountain one last time to celebrate the 50th anniversary of the lodge. Jack Huff (1903-1985), who built and operated the Lodge from 1926 to 1959, had over 1,000 climbs when he stopped counting in 1937, according to a 1940 newspaper story by Pulitzer Prize-winner Ernie Pyle. Assuming he maintained that pace, he probably climbed Le Conte over 3,000 times. Huff once hiked up with his mother on his back, sitting in a straight-back chair that he wore like a backpack. Rev. Rufus Morgan (1885-1983), "Moses of the Mountains," climbed Le Conte 174 times, 22 of those after he turned 89. He usually hiked up on his birthday, the last time at 93 in 1978. There is a web page dedicated to him at lecontelodgealum.org. Back when I first climbed Le Conte, the undisputed champion was Gracie McNicol (1891-1991), a nurse who logged 244 climbs, the first time when she was 62 and the the final trip to celebrate her 92nd birthday in 1983, fulfilling a promise she made to Rev. Morgan. Gracie made 155 hikes and 89 trips by horseback. An overlook at the halfway point of the Alum Cave trail is named in her honor: "Gracie's Pulpit." Her story is documented in Emilie Ervin Powell's book "Gracie and the Mountain: Growing Young Climbing Mount Le Conte". She died just three weeks short of her 100th birthday. Dinwiddie offered an interesting perspective in his trip report of July 8, 1987, regarding his friendly footrace with Stevenson: "She will do her 300th hike Saturday. I did my 300th hike a year ago last June. For my part, it is not how many trips you make but how much time you spend on the mountain. In this respect Gracie McNicol is far ahead." There are many more. Dave Scanlon (1936-2014) made 982 climbs, usually bringing up the Monday newspaper. His last hike was just 25 days before his death. Dr. Jesse "Kip" Miller made his 100th hike in 2000, just 24 days after heart bypass surgery. He and his wife Jean Ann Miller made their 239th climb together on her 79th birthday in 2012. Several longtime staff members at Le Conte Lodge have made hundreds of trips up the mountain, including over 900 by llama wrangler Alan Householder, who has logged over 12,000 miles on the Trillium Gap Trail. The highonleconte blog in 2013 said that the lodge general manager, Tim Line, likely has made over 1,000 ascents. We should note that the lodge is about 200 feet below the summit. Many hikers stop at the lodge rather than continuing to the High Top, so their accomplishments might be discounted by legalistic peakbaggers. (Wright was conscientious about going all the way to High Top in his record-setting year of 1991, but in later years he often stopped at the lodge.) Many pose for pictures in front of the dining hall, where a sign shows the elevation of the summit (6,593) rather than the actual elevation of the lodge (about 6,400). For the purposes of this list, I am making no distinction between hikes to the Lodge or to High Top. None of those with over 100 ascents have logged them on listsofjohn.com or peakbagger.com. Based on climbs that have been entered on peakbagger and listsofjohn, the Le Conte leader is Rick Shortt, who was in my group for this hike—the 11th time he has climbed this mountain. However, Rick was not even the leader in the lodge the night we were there. The mom in the cabin next to us was making her 24th climb. Another hiker in the dining hall claimed 63. Also with me on this hike was Mike Hembree, making his 6th ascent. Mike and I first climbed Le Conte together for a newspaper assignment over 25 years earlier. Mike, Rick, and I were joined this time by Ralph Phillips and Larry Trivette. We came up the Boulevard on 7/22, stayed overnight at Le Conte Lodge, and went down Alum Cave on 7/23. Along the way, I bagged Mt Kephart and Mt Ambler, and Rick and Larry made the 3-mile side trip to Charlie’s Bunion. What makes it so attractive? Le Conte has everything. The centerpiece is the historic lodge, which is so popular that you have to make reservations a year in advance. 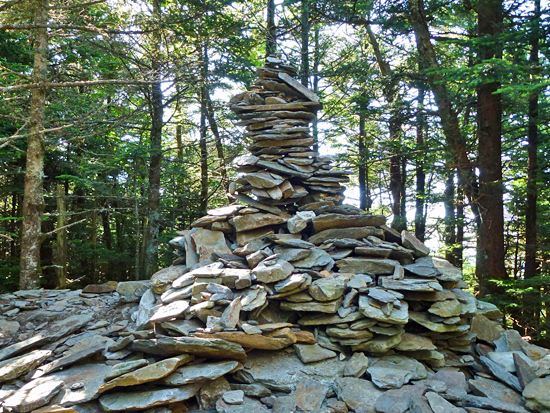 There are six trails to choose from and three promontories with unique attractions—sunrise from Myrtle Point, sunset from Cliff Tops, and a monumental cairn that has raised the natural 6593 high point to a little over 6600 feet. As I worked on this report, I did a little googling and other research to try to find out the most climbs anyone has logged on one mountain. Some claim that New Hampshire's Grand Monadnock is the most-climbed mountain in the US--and second or third in the world, behind China's Tai Shan and Japan's Fuji. I have not found any documentation for this, and it's almost certainly not true. Monadnock State Park has 120,000 visitors per year, who face a daunting hike (4.2 miles climbing 1800 feet) to the summit. By comparison, Mount Mitchell State Park averages 300,000 visitors per year with an easy stroll up a quarter-mile paved walkway from the summit parking lot. I suspect that other accessible peaks (such as Clingmans Dome, Mount Washington, Pikes Peak, Mount Evans, and Sandia Crest) are also contenders for this honor. There's no denying, however, that Monadnock is home to some of the nation's most persistent and dedicated climbers. I found a YouTube interview featuring Larry Davis, who climbed Monadnock for 2,850 consecutive days in the 1990s and was approaching his 6,000th climb when the video was made 2011-08-14. Another climber named Garry Harrington was approaching 1,000 trips up Monadnock. Otherwise, I have found nothing even close to the Le Conte leaders. According to Multiple Repeats by a Member on listsofjohn, the pacesetter is Rick Baugher, who surpassed 800 climbs of Kelly Mountain, Idaho, in the summer of 2014. This page has been served 2926 times since 2005-01-15.